So, you just arrived to South Florida and you have a free day before visiting the big parks. Personally I’d love to have simply chilled out and enjoyed the weather and my surroundings. However, my 9- and 3-year-olds are so not into ‘chilling out’ and enjoying surroundings unless they are raising some sort of havoc. They want to have fun. But what fun things can one do in South Florida with kids? I had to do a quick search once we got there because I had nothing planned and found mini golf. 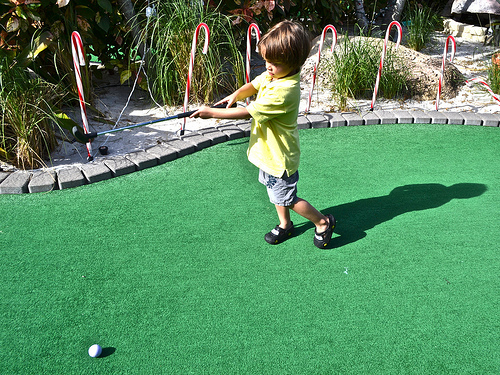 We live in Central America, where the mini golf options are extremely limited. There are a couple of courses in Guatemala but they are a poor excuse for it. However, it did get my boys curious about it so they were pretty excited with the idea when I told them we’d be going to Putt’n Around in Delray Beach. We were pleasantly surprised to see that, as you walk in, the lounge area and bar looked like a sports bar (I think it’s a place to hang out at night). My boys loved this area. It was great to have a place to rest before and after the big game. 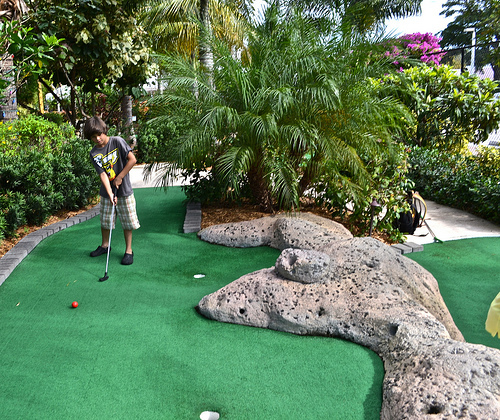 Putt’n Around offers two golf courses, each with 18 holes. You can either do one or both. We went only for the one with the ocean theme. So the fun has begun. My oldest boy had some practice in Guatemala but my baby didn’t have a clue and ended up almost kicking our butts by the end of the day. 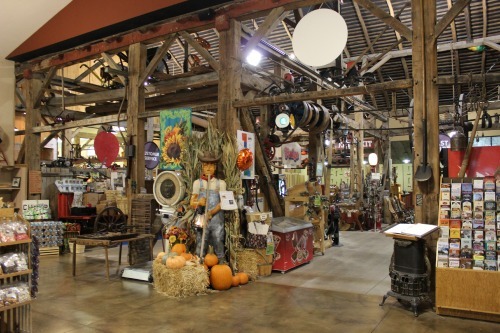 Aside from all of the golfing fun we had, we also had fun exploring the place and looking at its décor. There were fountains in the background and between holes. This ended up being part of the challenge too, because occasionally the ball falls in. So don’t be scared of getting wet, get it out and play again. After a good day at mini golf, a hot dog and pizza always hit the spot. Weather – It can get really hot in Florida. We were there this last December and it was smoldering out and also extremely humid. A good idea would be to come in layers that way you can take them off or put them on to appropriate measures to enjoy the outdoor activity. Also, don’t forget to bring sunscreen and plenty of water. Keep in mind that it rains here — not a lot, but enough to get the mosquitoes to multiply at insane rates. They were everywhere! We didn’t have repellent, but trust me, we needed it! So come prepared – have bug spray. Courses to Play – As I mentioned before, there are two courses, each with 18 holes and you can do them both. My boys are 9 and 3, so 18 holes was too much for them. I think 36 are more for adults hanging out or teens having fun. But for young kids one course is the way to go. Duration – There is no time limit. You can spend anywhere from two hours to five hours. It all depends on how fast you and your kids want to go. We were done after two hours including lunch. It was a bit hotter and humid that what they are used to. Next Post: Unnecessary (and Goofy) Hotel Room "Extras"